A Michelin starred French Chef, Joel Robuchon, has made an amazing discovery: simple dishes, with a minimum of tasty, quality, ingredients, combined with minimal preparation techniques, taste good. Satisfyingly good. Good enough to stand on their own. There is an article in today’s New York Times, where Chef Robuchon explains a few dishes that he makes for his “Atelier’ restaurants. The dishes sound delicious and interesting; but what caught my eye is the way he talked about presenting simple dishes, simply made. This is the heart and soul of Italian cooking. I remember the first time I saw a plate of proscuitto being served at a restaurant in Italy. There was nothing else on the plate but the pink ribbons of proscuitto. I remember being surprised that the restaurant would serve such an unadorned dish, and being surprised that someone would order such a plain dish. Couldn’t he just go to the corner deli and get some? What was the point of going to a restaurant for that? That was before I learned about the exquisite art of proscuitto, about how technique and instinct merge to make this cured ham. 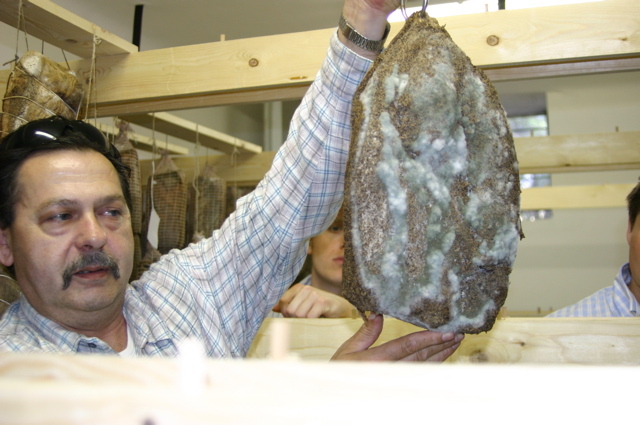 How the specific mold of the aging room is guarded and nurtured; how the very air affects the flavor; how, if you know a restaurant that has a particularly good proscuitto, you want nothing else. How a simple plate of nothing but proscuitto is close to divine. No question that Chef Robuchon is an incredible chef and talent; but, the article made me smile: the Italians have already made simplicity a sacred art form. And now, where chemical compounds that will glue chicken skin to a salmon, are all the rage, it’s heartening to see someone go back to simple plate of cured ham, and honor it accordingly.